Dr. Richard D. Edgerly received his Bachelor of Science degree in Bacteriology and Public Health from Washington State University. After spending 13 years in laboratory medicine and healthcare administration he received his MD from the University of Washington School of Medicine. He completed his internship and residency in Family Practice at Central Washington Family Medicine in Yakima, Washington. Dr. Edgerly has practiced medicine in the Yakima Valley for over 20 years. During that time he has served as chairman of the Family Medicine Department at both Yakima Regional and Yakima Valley Memorial hospitals. 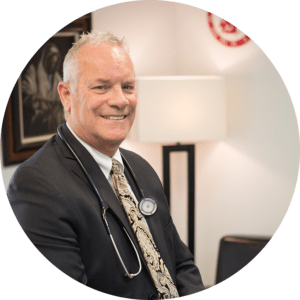 He has been the Physician Director for Health Management Associates at both the local and the national levels and also served as the Chairman of the Physician Executive Committee before starting Assurance Healthcare & Counseling Center. He has served as Chief of Staff as well as numerous other positions of leadership throughout his tenure.